For the Irish band, see The Fat Lady Sings. It ain't over till (or until) the fat lady sings is a colloquialism which is often used as a proverb. It means that one should not presume to know the outcome of an event which is still in progress. More specifically, the phrase is used when a situation is (or appears to be) nearing its conclusion. It cautions against assuming that the current state of an event is irreversible and clearly determines how or when the event will end. The phrase is most commonly used in association with organized competitions, particularly sports. The phrase is generally understood to be referencing the stereotypically overweight sopranos of the opera. The imagery of Richard Wagner's opera cycle Der Ring des Nibelungen and its last part, Götterdämmerung, is typically the one used in depictions accompanying reference to the phrase. 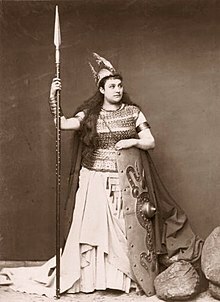 The "fat lady" is the valkyrie Brünnhilde, who is traditionally presented as a very buxom lady. Her farewell scene lasts almost twenty minutes and leads directly to the finale of the whole Ring Cycle. As Götterdämmerung is about the end of the world (or at least the world of the Norse gods), in a very significant way "it is [all] over when the fat lady sings." The saying has become so well known that it was the subject of an article in the journal Obesity Reviews. Don Meredith, the first Dallas Cowboy quarterback, would say "It ain't over till the fat lady sings" as a color commentator on Monday Night Football in the early 70's. Despite his obvious allegiance to the Red Raiders, Texas Tech sports information director Ralph Carpenter was the picture of professional objectivity when the Aggies rallied for a 72–72 tie late in the SWC tournament finals. "Hey, Ralph," said Bill Morgan, "this... is going to be a tight one after all." "Right", said Ralph, "the opera ain’t over until the fat lady sings." Bill vividly remembers the comment and the uproar it caused throughout the press box. He always assumed it was coined on the spot. "Oh, yeah, it was vintage Carpenter. He was one of the world’s funniest guys," said Bill, a contender for that title himself. The 1976 use of the phrase was discovered by Fred R. Shapiro, who published it in The Yale Book of Quotations. It had previously been attributed to sportswriter and broadcaster Dan Cook, who used the phrase after the first basketball game between the San Antonio Spurs and the Washington Bullets (now the Washington Wizards) during the 1978 NBA Playoffs. Cook used the line to illustrate that while the Spurs had won once, the series was not over yet. Shapiro called this a notable example of misattribution. "It ain't over till it's over", a phrase popularized by baseball player Yogi Berra. "Don't count your chickens before they hatch", a well-known saying which originated in the 16th century. "Nothing is carved in stone", a phrase meaning that the future can always be changed. ^ "Libretti Götterdämmerung". Richard Wagner. Retrieved January 30, 2015. ^ Rössner, S. (2014-10-01). "'It ain't over till the fat lady sings'". Obesity Reviews. 15 (10): 851–852. doi:10.1111/obr.12219. ISSN 1467-789X. PMID 25213703. ^ Pincus, David (March 9, 2010). "Today in Sports History: March 10th". SBNation. Vox Media, Inc. Retrieved January 30, 2015. ^ Blow, Steve (November 26, 2006). "Fat lady first sang in the pages of The News". Dallas Morning News. ^ Adams, Cecil (October 25, 1991). "What's the origin of "the opera ain't over till the fat lady sings?"". The Straight Dope. Retrieved January 30, 2015. ^ Fred R. Shapiro, ed. (2006). The Yale Book of Quotations. Yale University Press. p. xix. ISBN 978-0-300-10798-2. This page was last edited on 3 March 2019, at 21:32 (UTC).